Hello there and happy almost weekend! I can’t think of a better way to start this Friday than with a little weekend casual outfit inspiration. I’ve had these shoes on my wish list for a few years now. With a Christmas gift card burning a hole in my pocket, I decided it was the perfect time to pull the the trigger and finally buy them. AND I am so happy I did. I kind of wish I would have purchased them sooner. They pair perfectly with both jeans and dresses. For me, they fit true to size. They felt a little tight when I first put them on, but I loosened the laces which made them fit so much better. The leather also stretches ever so lightly with wear too. The laces tie in a bow, but I prefer to tuck it in for a cleaner look. I just place each half to the side, so it doesn’t show through the front part. 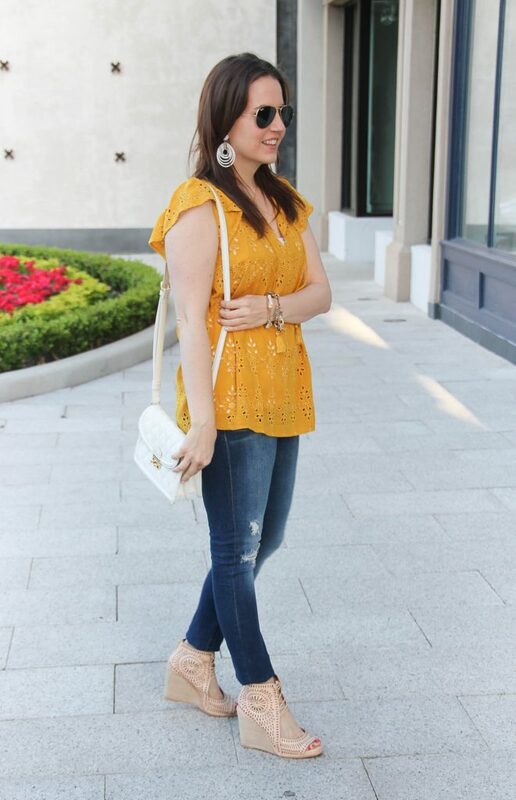 Yellow is high on my color crush list for spring and summer. I keep finding items in so many different shades, I love it! 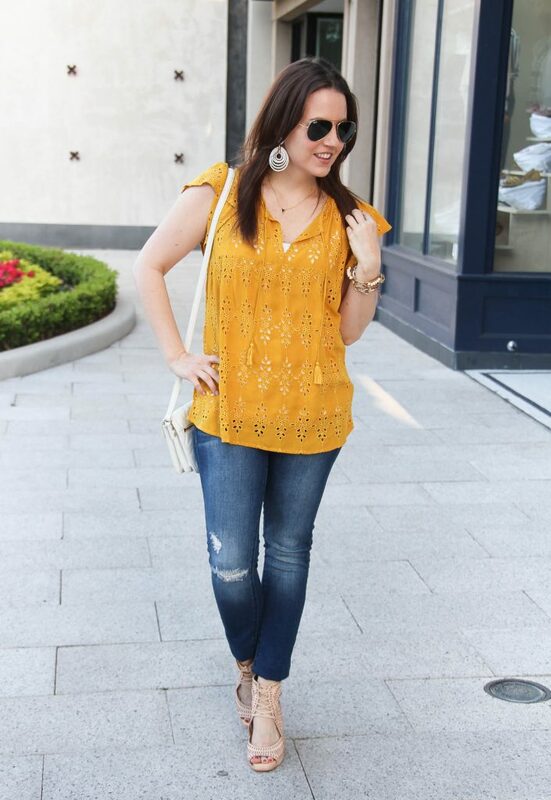 The mustard yellow is a great choice to work for fall too. 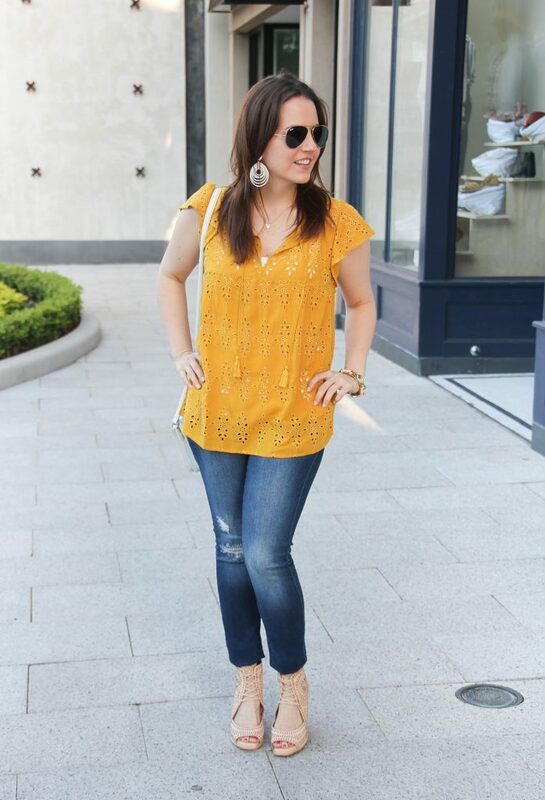 This top keeps going in and out of stock, so I found more cute yellow tops below. I hope ya’ll have a fabulous weekend. Thanks for taking some time to stop by today! 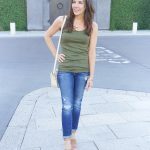 Love this top! The eyelet is such a cute touch! What a perfect outfit! Love that color! 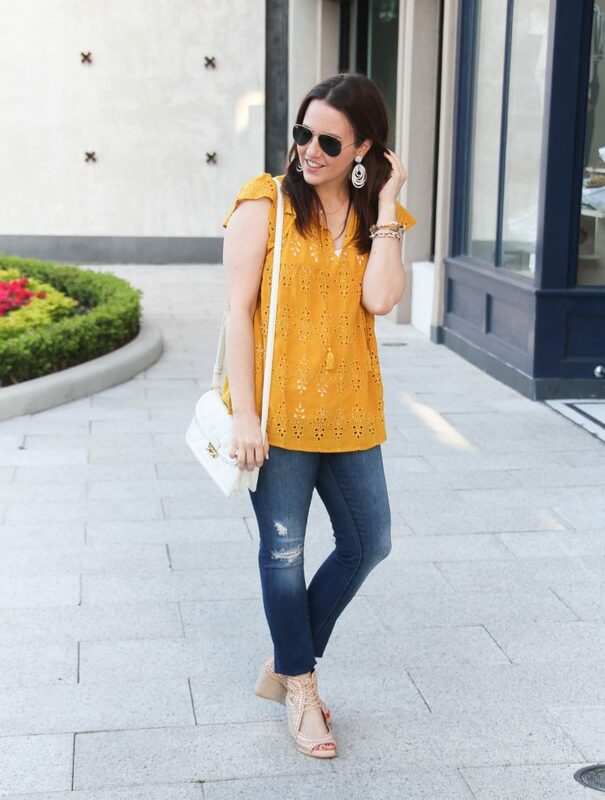 Loving the yellow and eyelet pattern and I’m pretty sure I need those shoes! Thanks for linking up with us! I really love your top! Nice casual outfit 😉 Enjoy the week-end! That is such a fun color! It definitely looks like the ideal spring piece! 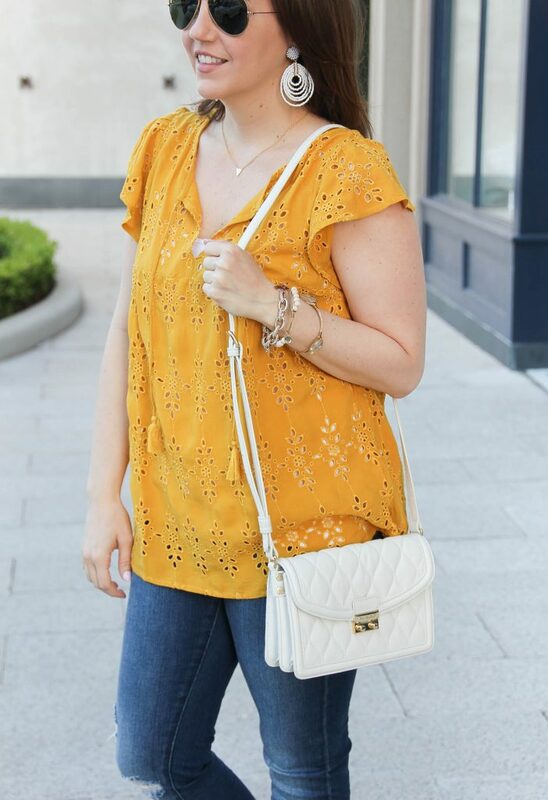 Such a beautiful blouse – I love the color and cut out detail. 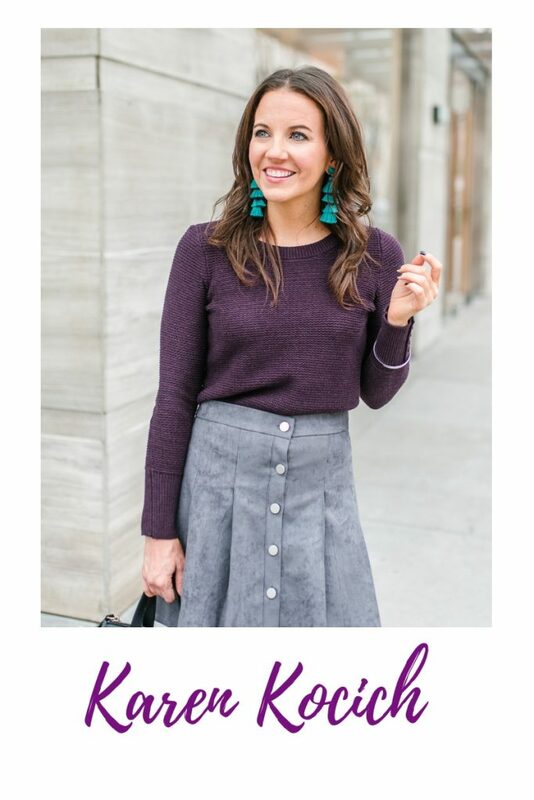 Thanks for linking up with Fabulous Friday!